REUTERS/Fahad ShadeedSaudi Arabia’s Oil Minister Ali al-Naimi. OPEC leader Saudi Arabia signaled on Wednesday it was unlikely to push for a major change in oil output at the producer group’s meeting this week, a day after Russia refused to cooperate in any production cut. Saudi Oil Minister Ali al-Naimi said he expected the oil market “to stabilise itself eventually” but did not comment on talks with Russia held Tuesday, which produced no firm pledge from Moscow to help support flagging oil prices. Iranian Oil Minister Bijan Zangeneh said some OPEC members, although not Iran, were gearing up for a battle over market share and insisted that non-OPEC producers needed to participate in any OPEC-led output cut. “The most important thing for all of us is the unity and solidarity of OPEC, and in this situation I believe we need to have the contribution of non-OPEC producers for managing the market,” Zangeneh told reporters. “Some OPEC members believe that this is the time where we need to defend market share … All the experts in the market believe we have oversupply in the market and next year we will have more oversupply,” he added. OPEC’s meeting Thursday will be one of its most crucial in recent years, with oil prices having tumbled some 30 per cent since June to below $US79 per barrel because of booming US shale oil output and slower global economic growth. Among the 12 members of the Organisation of the Petroleum Exporting Countries, Venezuela and Iraq have called for output cuts. 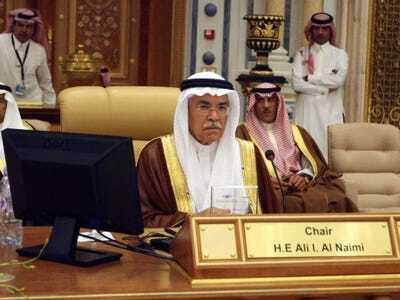 Naimi has not commented on what the group should do. OPEC usually faces huge tensions from within, but as talks over Iran’s nuclear program ended with no breakthrough on Monday, most members felt relief they would not have to deal with a deluge of Iranian oil, currently hit by Western sanctions. Non-OPEC member Russia, which produces 10.5 million barrels per day (bpd) or 11 per cent of global oil, came to Tuesday’s meeting amid hints it might agree to cut output as it suffers from oil’s price fall and Western sanctions over Ukraine. But as that meeting with Naimi and officials from Venezuela and non-OPEC member Mexico ended, Russia’s most influential oil official, state firm Rosneft’s head Igor Sechin, emerged with a surprise message: Russia will not reduce output even if oil falls to $US60 per barrel. Sechin added that he expected low oil prices to do more damage to producing nations with higher costs, in a clear reference to the shale boom in the US. Many at OPEC were taken by surprise by Sechin’s suggestion that Russia — in desperate need of oil prices above $US100 per barrel to balance its budget — was ready for a price war. “Gulf states are less bothered about a price drop compared to other OPEC members,” an OPEC source close to Gulf thinking said, adding that non-OPEC members ultimately needed to cut output if they expected the group to defend prices. OPEC produces 30 million bpd, or a third of global oil. Its publications have shown in recent months that global supply will exceed demand by more than 1 million bpd in the first half of next year. While the statistics speak in favour of a cut, the buildup to the OPEC meeting =Thursday has seen one of the most heated debates in years about the next policy step for the group. While price hawks like Venezuela have urged an immediate output cut, some Saudi officials told private briefings in recent months that the kingdom was prepared to withstand low prices — possibly $US70 a barrel — for a prolonged period. Those messages have sparked conspiracy theories ranging from Saudis seeking to curtail the US oil boom, which needs high prices to remain profitable, to Riyadh looking to undermine Iran and Russia because of their support of Saudi’s arch-enemy, Syrian President Bashar Assad. “I think even Saudi Arabia doesn’t know yet whether a cut can be achieved,” said Virendra Chauhan, an analyst at the Energy Aspects think tank.